Less than 24 hours after the worst terrorist attack in Manchester's history, its people came together to remember the 22 victims who went to enjoy one of the city's favourite pastimes - going to a gig - but never came home. Basked in early evening sunshine, the mood in Albert Square was sombre but strong. Manchester is a city of glorious, rebellious positivity and thousands were here to make that point in front of the cameras of the world's press. While some had come to simply pay their respects to those killed and injured by an appalling act, others also wanted to stand firm in the face of horror. "Love over hate, that's the message," said one woman, finishing off a poster of support, while in another corner of the square, the Manchester Sikh Community handed out free drinks, a gesture to "help the city at a time when things are bad". As the Town Hall bells chimed six, the throng fell silent - ready, respectful, resilient - so that only the leaves could be heard blowing through the trees. Image caption The Manchester Sikh Community handed out free drinks to "help the city at a time when things are bad"
The silence held for a full five minutes before the Lord Mayor Eddy Newman began to speak. His was a message of thanks for the emergency services and defiance in the face in the terrorism, words that were met with cheers and loud applause. He was followed by others with equally unbending speeches. The Bishop of Manchester, the Rt Rev David Walker, spoke of the city's unerring belief in diversity and unity and said those who would seek to destroy such things were "the very few, but we are the many, we are Manchester". The victims of the attack, he said, were now "Manchester too", regardless of where they came from. Greater Manchester Police's Chief Constable Ian Hopkins echoed those words and added the stories of those who came together in the aftermath; of the doctors who came in when they were off shift, the communities who opened their doors to the displaced and the emergency crews who worked tirelessly through the night. And after the speeches and an impeccably observed minute of silence, an moment of release, as the thousands gathered broke into a chant of the city's name. 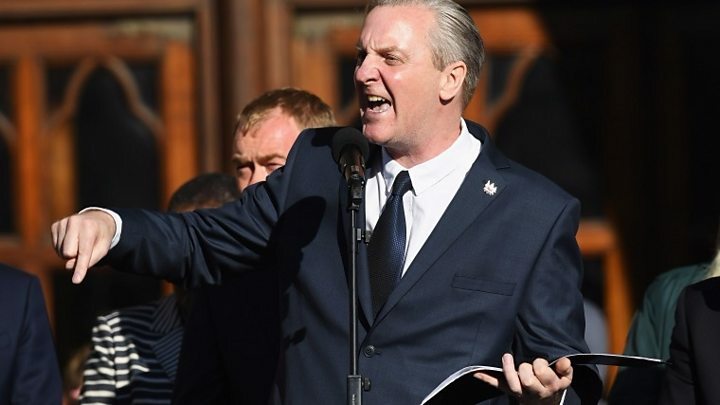 But shining out from the midst of it all was poet Tony Walsh's reading of his ode to Manchester, This Is The Place, that captured the moment best. A run-through of what and why the city is so special, it was met with cheers and a simple ending which summed up the feelings of all those in the square. "Choose love, Manchester", he said, to an enormous ovation.